Choosing a partner is easy, yet everyday's real test is confirming your choice. Even close-knit couples need to take a break from everything and everybody now and then, and to look after themselves with a quiet beautifying pause. And what setting would be better than Bormio and the mountains of the Parco Nazionale dello Stelvio national park? It is the place to spend a magic romantic week or even just a weekend for two, in both winter and summer. All double standard rooms are perfect for holidays with your loved one, yet the gabled ones are packed with special atmosphere. Imagine enjoying the wintery snowy view together, looking out from your balcony and breathing in the stunning beauty of the heights! Each discovery is even more appealing when experienced with somebody. Better if someone special. Enjoy the moment, treat yourselves to a romantic candle light dinner at our restaurant! A number of cycle trails run close to the hotel, including great favourite Sentiero Valtellina. 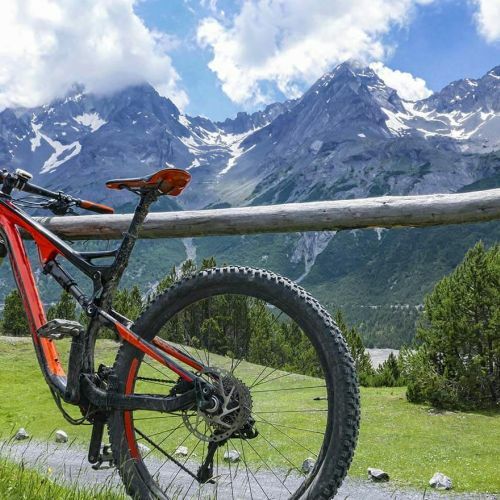 So, you can just ride off on a long excursion, even a rather easy and relaxing one, to explore the neighbourhood and let Bormio charm you! In addition to the guided excursion we organise at Hotel Alpi & Golf, you can go on many others, seeking the best settings for memorable extra romantic selfies! Recommended destinations include Laghi di Cancano lakes, Forte di Oga fort, Valle dei Forni valley, and Santa Caterina Valfurva - plus several other options!